With a top speed approaching Mach 3.0, the supersonic BrahMos missile is a game changer – for many reasons. 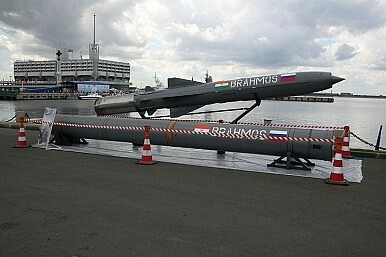 Indians take pride in the BrahMos anti-ship cruise missile, or ASCM. I was taken aback some years ago when some Indian friends—gentle souls with little interest in military affairs—professed satisfaction at this successful venture into defense R&D.While that encounter induced some vertigo, it makes sense when you think about it. The Indian military has long been a consumer of hardware manufactured by others. By fielding the BrahMos, India in effect kicked in the door to an exclusive club of nations that design and produce high-tech defense articles. Beyond simply augmenting the Indian Navy’s (and Army’s, and eventually Air Force’s—of which more later) striking power, this lethal “bird” signifies that India is coming of age as a great power. Great powers operate aircraft carriers and nuclear submarines. They build their own military equipment. Seemingly workmanlike endeavors like weapons design and manufacturing present an aspirant to global leadership a kind of talisman. Indigenously built weapons embody intangibles like national honor and grandeur. Here endeth the philosophizing. Jointly developed by India’s Defense Research and Development Organization and Russia’s Mashinostroyeniye Company, the BrahMos is a stealthy, supersonic missile designed to elude shipboard defenses like the Aegis combat system, a combined radar and fire-control system found on board American, Japanese, and South Korean destroyers and cruisers. (Spain and Norway operate the system as well, while the Royal Australian Navy is outfitting its next-generation warships with it.) Aegis has stood at the vanguard of fleet air defense since the early 1980s, when USS Ticonderoga, the U.S. Navy’s first Aegis cruiser, stood out to sea. Getting past Aegis is an achievement. Judging from the technical parameters, the Indian Navy has one-upped the U.S. Navy in this niche technology. On paper, the Indian ASCM appears superior to the AGM-84 Harpoon, long the U.S. Navy’s workhorse anti-ship missile. It certainly outranges the Harpoon. The BrahMos can strike at targets 290 kilometers distant, more than double the advertised range“in excess of” 67 nautical miles (77 statute miles, or124 kilometers)for the Harpoon. And with a top speed approaching Mach 3.0, the supersonic BrahMos far outstrips the subsonic Harpoon. Speed kills. Helter-skelter speed compresses the time air defenders have to respond—and time is the critical determinant in the “detect-to-engage” sequence. It allows crews to attempt electronic countermeasures, loft surface-to-air missiles, launch decoys, or—as a last-gasp effort—engage an incoming missile with short-range guns. Shorter detect-to-engage time, then, means fewer rounds or countermeasures in the air to stop or deflect a hostile bird.But there’s another, less obvious advantage to high speed. Velocity imparts kinetic energy to any moving body.Accordingly, one body inflicts more damage when it slams into another at higher speed. Breakneck velocity magnifies a missile’s hitting powerbeyond the explosive power designed into its payload. That a speedy, extended-range weapon like the BrahMos is crucial to naval warfare in this age of long-range anti-ship weaponry is obvious from the US Navy’s 2009 decision to hurriedly develop a long range anti-ship missile, or LRASM, of its own. Otherwise U.S. surface action groups may not land the first blow in combat. And they may have to take a pounding for some time before hitting back. Even if fleets close on each other at top speed, it takes quite awhile for lumbering ships to cover the 166 kilometers separating the Harpoon’s range from that of the BrahMos. Assuming the technology pans out , LRASM will even the terms of long-range engagements. The Harpoon remains a good missile, that is, but American ships have to get fairly close to cut loose with Harpoon barrages. If the enemy outranges them, they have to beat back enemy missile attacks while closing to ASCM range. That increases their chances of incurring serious if not fatal damage before even taking offensive action. Admiral Horatio Nelson famously instructed Royal Navy commanders that “no Captain can do very wrong if he places his Ship alongside that of an Enemy.” But Lord Nelson lived before the advent of accurate long-range fire. He never would have given such advice knowing his ships could be put out of action before getting alongside for close-range gunnery duels. Any weapon is like a “black box” until it’s used in combat against real, thinking adversaries with the capacity to deploy countermeasures or strike back at the launch platform. So it’s hard to judge for sure. There’s more to anti-ship missiles than surface vessels pounding away at one another from afar. For example, the BrahMos can be fired from mobile launchers—basically trucks—on land. (Submarine- and air-launched variants are reportedly in the works as well.) That raises a host of intriguing possibilities for the Indian military. It promises to let New Delhi influence events at sea from the shore, much as Chinese rocketeers do off the East Asian seaboard. Think about Indian Ocean geography. South Asia’s maritime geography is less convoluted than East Asia’s, but India does possess some strategically placed features beyond the subcontinent—notably the Andaman and Nicobar island chains. The islands lie athwart the western approaches to the Strait of Malacca. They also lie within BrahMos range of one other, while nearby landmasses in Southeast Asia fall within range of the northernmost and southernmost islands. That means the Indian Army could emplace BrahMos batteries in the Andamans and Nicobars to threaten shipping passing through these archipelagoes. That would project India’s military reach to Southeast Asia without leaving Indian soil. An extreme measure? Sure. But no more extreme than Japan’s thinking about how to close the straits through the home islands and the Ryukyus in wartime. Small wonder Chinese pundits liken the Andaman and Nicobar islands to a “metal chain” stretched across sea lanes vital to China’s economic development. There are other possibilities. For example, the Indian Navy has “inducted”—that maddeningly vague term—its first nuclear-powered ballistic-missile submarine into the fleet while predicting the boat will be operational by the end of this year. But even if engineers have gotten the kinks out of the hull and its propulsion plant, INS Arihant will patrol the seas without working ballistic missiles to fire. As an interim measure, my friend Andrew Winner speculates (in our—finally!—forthcoming volume on nuclear strategy) that India will try to miniaturize a nuclear warhead sufficiently to fit on the BrahMos. The manufacturer is working on a missile variant that can be launched from torpedo tubes. If the technical details sort themselves out, that would give New Delhi an equivalent to the TLAM-N, the nuclear variant of the US Navy’s Tomahawk land-attack cruise missile. While unsatisfactory over the long haul, a nuclear-tipped BrahMos would supply the third leg of a nuclear triad, letting the Indian Navy threaten sites in Pakistan as a deterrent. Because of the BrahMos’s short range relative to ballistic missiles, however, the Arihant and its sisters would have to cruise the South China Sea—or beyond—to menace targets in China. The implications of Indian submarines’ prowling the crowded, increasingly contested South China Sea are worth pondering. It remains to be seen whether Indian technical wizardry will render such a system workable if New Delhi decides to pursue one, or whether engineers perfect a sea-launched ballistic missile first. The BrahMos program, then, is worth tracking—both as a yardstick for Indian scientific and technical progress and for its strategic and political implications. We live in interesting times. The Indian military’s new bird of preymakes them a little more interesting. While people fight wars, they need cutting-edge weapons to prevail. Missiles seem like a good choice.